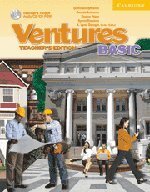 Ventures is a six-level, standards-based ESL series for adult-education ESL. The interleaved Teacher's edition walks instructors step-by-step through the stages of a lesson. Also included are suggested times for exercises, teaching tips, expansion activities, cultural information, and ways to expand a one-hour lesson to fill two or three instructional hours. The CD-ROM contains self-assessment pages, letter-formation practice sheets, alphabet and word cards, picture dictionary cards with worksheets, real-life documents, tests, and audio for tests.